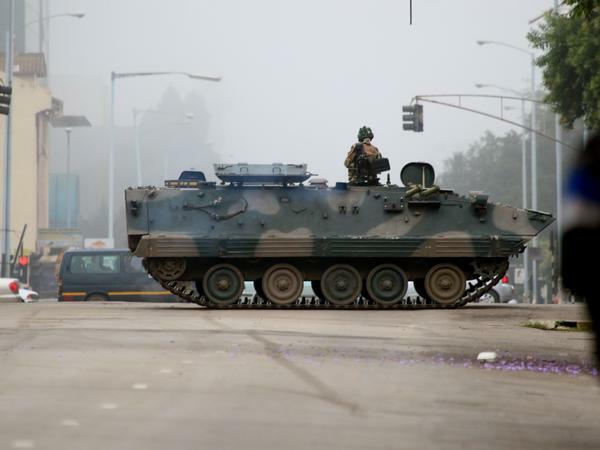 An armored personnel carrier seals off a main road to the presidential office in Harare, Zimbabwe, on Wednesday. 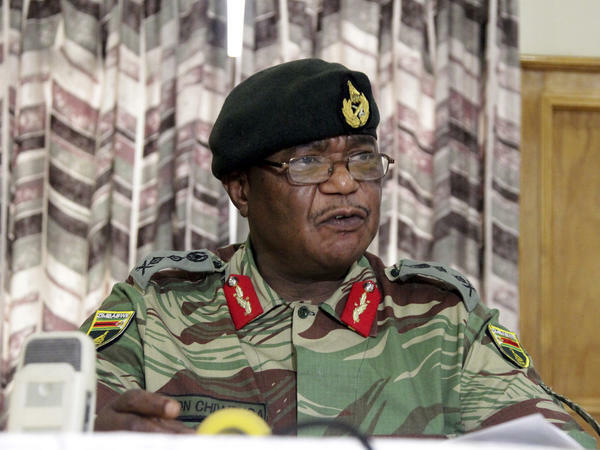 Zimbabwe's Army chief, Gen. Constantino Chiwenga, threatened at a Monday news conference in the capital to "step in" to calm political tensions over the president's firing of his deputy. "We are only targeting criminals around [Mugabe], who are committing crimes that are causing social and economic suffering in the country, in order to bring them to justice," according to the statement. However, just a week after Mugabe, 93, fired longtime vice president and liberation war veteran Emmerson Mnangagwa, accusing him of disloyalty and disrespect, an account purporting to belong to the ruling ZANU-PF party tweeted that Mnangagwa had been installed as the party's interim president. The apparent putsch, which the military is refusing to call a coup, marks the first time in Mugabe's 37-year rule that a public rift was visible between the military and the world's oldest head of state, who has been in office since the end of white minority rule in 1980. Initially, the governing party accused Army Chief Gen. Constantino Chiwenga of "treasonous conduct," but the party's account later tweeted: "There was no coup," but instead "a bloodless transition which saw corrupt and crooked persons being arrested." Apparently referring to Mugabe, the tweet said that "an elderly man who had been taken advantage of by his wife [was] detained." The ZANU-PF Twitter account retweeted a message from the party's youth league that said, "The army is simply effecting a National Democratic Project and it's doing so with peaceful aplomb." In the army's overnight broadcast, spokesman Gen. Sibusiso Moyo said the military expected "normalcy" to return as soon as the army had completed its "mission." Chiwenga had made an unprecedented announcement Monday that the army was prepared to intervene to halt party infighting and the purging of veterans, such as Mnangagwa, who fought Zimbabwe's independence war. Mnangagwa had been tipped as a likely successor to Mugabe, but fell foul of the president's powerful wife, Grace Mugabe. His removal was widely perceived as a prelude to Mugabe promoting the politically ambitious but controversial first lady to one of two vice presidential posts. In a statement attributed to Mnangagwa at the time he reportedly left for self-imposed exile, he promised to return to Zimbabwe to "lead" the country, warning Mugabe that the ZANU-PF party was not his personal property. The U.S. Embassy closed to the public and encouraged citizens to shelter in place, citing "the ongoing political uncertainty through the night." The British Embassy issued a similar warning and noted "reports of unusual military activity."